October 4 – 10, 2015 marks Fire Prevention Week, a commemoration of the Great Chicago Fire in 1871 and an opportunity to emphasize fire safety and preparedness. DO keep a smoke alarm on every level of your home. Half of home fire deaths happen between 11 p.m. and 7 a.m. Stay safe with smoke alarms outside of every bedroom and each separate sleeping area. 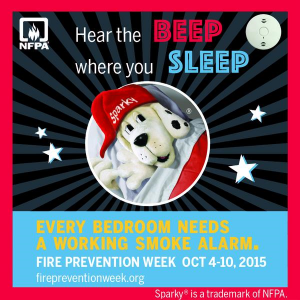 DON’T forget to test your smoke alarm every month. The risk of dying in a home fire is cut in half in homes with working smoke alarms. If your alarm doesn’t sound when tested, it’s time to replace it. DO address your needs. If you require eyeglasses, hearing aid, cane or a wheelchair, ensure they are next to your bed to quickly grab if necessary. If there is a fire, you may have less than three minutes to get out of your home. Be ready to act immediately. DON’T assume you’ll hear the fire alarm if it sounds. If you test the alarm and can’t hear it, consider getting a strobe light that will flash or a bed shaker that will shake when the smoke alarm sounds. DO make a fire escape plan that shows at least two ways out of every room. Identify a meeting place in the front of your home, to verify that everyone is safe and help firefighters ensure everyone exited safely. DON’T stop to call 911 until you’re safely outside and away from danger. Stay outside until the fire department says it’s safe to go back inside. For even more fire safety tips, visit the U.S. Fire Administration’s webpage at www.usfa.fema.gov.